Phosphorus (chemical symbol P, atomic number 15) is a multivalent nonmetal that belongs to the nitrogen group of chemical elements. Given its high reactivity, it is never found as a free element in nature. It is, however, a component of phosphate salts and is commonly found in inorganic phosphate rocks. In addition it is an essential element in all living cells. For instance, it is an integral part of the structures of DNA, RNA, phosphoproteins, and phospholipids. When purified artificially, several different allotropic forms of phosphorus can be obtained. The form known as white phosphorus emits a faint glow upon exposure to oxygen. This form should be handled with extreme care, as it is toxic and presents a significant fire hazard based on its extreme reactivity with oxygen in the air. The allotrope known as red phosphorus does not ignite spontaneously and is far less dangerous. The most important commercial use of phosphorus-based chemicals is the production of fertilizers. In addition, phosphorus compounds are widely used in explosives, nerve agents, friction matches, fireworks, pesticides, toothpaste, and detergents. The name phosphorus was derived from the Greek word phosphoros, meaning "light-bearing." It was the ancient name for the planet Venus. In Greek mythology, the related names Hesperos and Eosphoros were given to personifications of the Evening Star and Morning Star, respectively. According to the Oxford English Dictionary, the correct spelling of the element is phosphorus. The word phosphorous is the adjectival form for the P3+ valency. Just as sulfur forms sulfurous and sulfuric compounds, so phosphorus forms phosphorous and phosphoric compounds. Phosphorus is widely distributed in many different minerals. It is, however, not found free in nature because of its reactivity with oxygen in the air and in various substances. Phosphate rock, which is partially made of apatite (a group of tri-calcium phosphate minerals), is an important commercial source of this element. Large deposits of apatite are located in China, Russia, Morocco, and various other countries. In the United States, important deposits have been found in Florida, Idaho, Tennessee, and Utah. Phosphorus was discovered by German alchemist Hennig Brand in 1669 through a preparation from urine, which naturally contains considerable quantities of dissolved phosphates from normal metabolism. Working in Hamburg, Brand attempted to distill some salts by evaporating urine, and in the process produced a white material that glowed in the dark and burned brilliantly. Since that time, phosphorescence has been used to describe substances that shine in the dark without burning. Phosphorus was first made commercially for the match industry in the nineteenth century. The process involved distilling off phosphorus vapors from precipitated phosphates heated in a retort. The precipitated phosphates were made from ground-up bones that had been de-greased and treated with strong acids (Threlfall 1951). This process became obsolete in the late 1890s when the electric arc furnace was adapted to reduce phosphate rock (Threlfall 1951). Early matches contained white phosphorus, which was dangerous due to its toxicity. Murders, suicides, and accidental poisonings resulted from its use. In addition, exposure to the vapors gave match workers a necrosis of the jaw bones, known as "phossy jaw." When a safe process for manufacturing red phosphorus was discovered, with its far lower flammability and toxicity, laws were enacted (under a Berne Convention) requiring its adoption as a safer alternative for match manufacture. The electric furnace method allowed production to increase to the point phosphorus could be used in weapons of war. (Emsley, John. 2000). In World War I, it was used in incendiaries, smoke screens and tracer bullets (Threlfall 1951). A special incendiary bullet was developed to shoot at hydrogen-filled Zeppelins over Britain (hydrogen of course being highly flammable when it is ignited). During World War II Molotov cocktails of benzene and phosphorus were distributed in Britain to specially selected civilians within the British Resistance Operation, for defense; and phosphorus incendiary bombs were used in War on a large scale. Burning phosphorus is difficult to extinguish, and if it splashes onto human skin it has horrific effects (see precautions below). People covered in it were known to commit suicide due to the torment. Today phosphorus production is larger than ever, used as a precursor for various chemicals, (Aall 1952). in particular the herbicide glyphosate sold under the brand name Roundup. Production of white phosphorus takes place at large facilities and is transported heated in liquid form. Some major accidents have occurred during transportation, train derailments at Brownston, Nebraska and Miamisburg, Ohio lead to large fires. The worst accident in recent times though was an environmental one in 1968 when phosphorus spilled into the sea from a plant at Placentia Bay, Newfoundland. 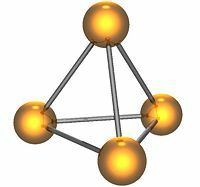 The tetrahedral shape of a molecule of white phosphorus. Arrangement of atoms in black phosphorus. In the periodic table, phosphorus is located in group 15 (former group 5A), between nitrogen and arsenic. In addition, it lies in period 3, between silicon and sulfur. When prepared artificially, it is obtained in several allotropic forms, most commonly white, red, and black. White phosphorus (P4) exists as individual molecules, each of which is made up of four phosphorus atoms in a tetrahedral shape. The four atoms are bound together by six single covalent bonds. The structure has a high ring strain and instability. White phosphorus is a yellow, waxy transparent solid. For this reason it is also called yellow phosphorus. It glows greenish in the dark (when exposed to oxygen), is highly flammable, and is pyrophoric (self-igniting) upon contact with air. It is also toxic, causing severe liver damage on ingestion. Combustion of this form gives a characteristic garlic smell. Samples are commonly coated with white "(di)phosphorus pentoxide," which actually consists of P4O10 molecules. Each P4O10 molecule has a tetrahedral shape with oxygen inserted between the phosphorus atoms and attached to their vertices. White phosphorus is insoluble in water but soluble in carbon disulfide. The white allotrope can be produced using several different methods. In one process, calcium phosphate, which is derived from phosphate rock, is heated in an electric or fuel-fired furnace in the presence of carbon and silica (Threlfall 1952). Elemental phosphorus is then liberated as a vapor and can be collected under phosphoric acid. This process is similar to the first synthesis of phosphorus from calcium phosphate in urine. Red phosphorus may be formed by heating white phosphorus to 250°C (482°F) or by exposing white phosphorus to sunlight. Phosphorus after this treatment exists as an amorphous network of atoms which reduces strain and gives greater stability, further heating results in the red phosphorus becoming crystalline. Red phosphorus does not catch fire in air at temperatures below 240°C, whereas white phosphorus ignites at about 40°C. In 1865, Hittorf discovered that when phosphorus was recrystallized from molten lead, a red/purple form is obtained. This purple form is sometimes known as "Hittorf's phosphorus," in addition a fibrous form with similar phosphorus cages. Below is shown a chain of phosphorus atoms which exhibits both the purple and fibrous forms. 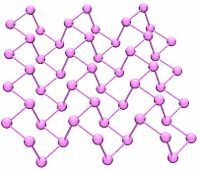 One of the forms of red/black phosphorus is a cubic solid. (Ahuja 2003). Black phosphorus has an orthorhombic structure (Cmca) and is the least reactive allotrope. It consists of many six-membered rings that are interlinked. Each atom is bonded to three other atoms (Brown, et al. 1965). (Cartz, et al. 1979). A recent synthesis of black phosphorus using metal salts as catalysts has been reported. (Lange 2007). The glow from phosphorus was the attraction of its discovery around 1669, but the mechanism for that glow was not fully described until 1974. It was known from early times that the glow would persist for a time in a stoppered jar but then cease. Robert Boyle in the 1680s ascribed it to "debilitation" of the air. It was later determined that the glow was produced when oxygen in the air was being consumed. Yet, by the eighteenth century, it was known that phosphorus does not glow at all in pure oxygen; (Olander 1956)Nobel Prize in Chemistry 1956 - Presentation Speech, by Professor A. Ölander]. There is only a range of partial pressures (of oxygen) where it does, too high or too low and the reaction stops. Heat can be applied to drive the reaction at higher pressures. In 1974, the glow was explained by R. J. van Zee and A. U. Khan. (Emsley 2000). A reaction with oxygen takes place at the surface of the solid (or liquid) phosphorus, forming the short-lived molecules HPO and P2O2 that both emit visible light. The reaction is slow and only very little of the intermediates is required to produce the luminescence, hence the extended time the glow continues in a stoppered jar. Although the term phosphorescence is derived from phosphorus, the reaction in this case is properly called luminescence (or chemoluminescence), which means "glowing by its own reaction." It is not phosphorescence, which is the property of a material "re-emitting light that previously fell on it." 32P; a beta-emitter (1.71 MeV) with a half-life of 14.3 days which is used routinely in life-science laboratories, primarily to produce radiolabeled DNA and RNA probes, e.g., for use in Northern blots or Southern blots. Because the high energy beta particles produced penetrate skin and corneas, and because any 32P ingested, inhaled, or absorbed is readily incorporated into bone and nucleic acids, OSHA requires that a lab coat, disposable gloves, and safety glasses or goggles be worn when working with 32P, and that working directly over an open container be avoided in order to protect the eyes. Monitoring personal, clothing, and surface contamination is also required. In addition, due to the high energy of the beta particles, shielding this radiation with the normally used dense materials (e.g. lead), gives rise to secondary emission of X-rays via a process known as Bremsstrahlung, meaning braking radiation. Therefore shielding must be accomplished with low density materials, e.g. Plexiglas, Lucite, plastic, wood, or water. 33P; a beta-emitter (0.25 MeV) with a half-life of 25.4 days. It is used in life-science laboratories in applications in which lower-energy beta emissions are advantageous, such as DNA sequencing. Phosphorus is a key element in all known forms of life. Inorganic phosphorus in the form of the phosphate PO43- plays a major role in biological molecules such as DNA and RNA where it forms part of the structural framework of these molecules. Living cells also utilize phosphate to transport cellular energy via adenosine triphosphate (ATP). Nearly every cellular process that uses energy gets it in the form of ATP. ATP is also important for phosphorylation, a key regulatory event in cells. Phospholipids are the main structural components of all cellular membranes. Calcium phosphate salts are used by animals to stiffen their bones. An average person contains a little less than 1 kg of phosphorus, about three quarters of which is present in bones and teeth in the form of apatite. A well-fed adult in the industrialized world consumes and excretes about 1-3 g of phosphorus per day in the form of phosphate. Phosphorus is an essential macromineral, which is studied extensively in soil conservation in order to understand plant uptake from soil systems. In ecological terms, phosphorus is often a limiting nutrient in many environments, i.e., the availability of phosphorus governs the rate of growth of many organisms. In ecosystems an excess of phosphorus can be problematic, especially in aquatic systems, see eutrophication and algal blooms. Organic compounds of phosphorus form a wide class of materials, some of which are extremely toxic. Fluorophosphate esters are among the most potent neurotoxins known. A wide range of organophosphorus compounds are used for their toxicity to certain organisms as pesticides and herbicides, and weaponized as nerve agents. Most inorganic phosphates are relatively nontoxic and essential nutrients. When the white form is exposed to sunlight or when it is heated in its own vapor to 250°C, it is transmuted to the red form, which does not phosphoresce in air. The red allotrope does not spontaneously ignite in air and is not as dangerous as the white form. Nevertheless, it should be handled with care because it does revert to white phosphorus in some temperature ranges and, when heated, it emits highly toxic fumes that consist of phosphorus oxides. Upon exposure to elemental phosphorus, in the past it was suggested to wash the affected area with two percent copper sulfate solution to form harmless compounds that can be washed away. According to the recent US Navy's Treatment of Chemical Agent Casualties and Conventional Military Chemical Injuries: FM8-285: Part 2 Conventional Military Chemical Injuries, "Cupric (copper(II)) sulfate has been used by U.S. personnel in the past and is still being used by some nations. However, copper sulfate is toxic and its use will be discontinued. Copper sulfate may produce kidney and cerebral toxicity as well as intravascular hemolysis." The manual suggests instead "a bicarbonate solution to neutralize phosphoric acid, which will then allow removal of visible WP. Particles often can be located by their emission of smoke when air strikes them, or by their phosphorescence in the dark. In dark surroundings, fragments are seen as luminescent spots." Then, "Promptly debride the burn if the patient's condition will permit removal of bits of WP which might be absorbed later and possibly produce systemic poisoning. DO NOT apply oily-based ointments until it is certain that all WP has been removed. Following complete removal of the particles, treat the lesions as thermal burns." As white phosphorus readily mixes with oils, any oily substances or ointments are disrecommended until the area is thoroughly cleaned and all white phosphorus removed. As seen in PCl5, phosphorus can accommodate a total of 10 valence electrons instead of the 8 determined by the octet rule, thus being a basis for the 18-electron rule. ↑ Phosphorus Topics page, at Lateral Science. Retrieved August 12, 2007. ↑ PHOSPHOROUS - 32. Retrieved August 12, 2007. ↑ emedicine.com CBRNE - Incendiary Agents, White Phosphorus (Smoking Stool Syndrome). Retrieved August 12, 2007. ↑ Emergency War Surgery NATO Handbook: Part I: Types of Wounds and Injuries: Chapter III: Burn Injury: Chemical Burns And White Phosphorus injury. Retrieved August 12, 2007. ↑ Skinner. 1990. Methamphetamine Synthesis Via Hydriodic Acid/Red Phosphorus Reduction of Ephedrine. Forensic Sci. Int'l 48: 123-34. ↑ DEPARTMENT OF JUSTICE. Drug Enforcement Administration. List I precursor Chemicals 66 FR 52670—52675. 2001. Retrieved August 12, 2007. ↑ Department of Justice. Drug Enforcement Admin. Doc. 21 CFR 1309. 21 CFR 1309. Retrieved August 12, 2007. ↑ CSA 21 USC, Chapter 13 (Controlled Substances Act). Retrieved August 12, 2007. Aall, C. H. 1952. The American Phosphorus Industry. Industrial & Engineering Chemistry 44 (7): 1520-1525. Ahuja, R. 2003. Physica Status Solidi, Sectio B: Basic Research 235: 282-287. Brown, A., S. Runquist. 1965. Acta Crystallogr 19: 684. Cartz, L.; S.R. Srinivasa; R.J. Riedner; J.D. Jorgensen; T.G. Worlton. 1979. Journal of Chemical Physics 71: 1718-1721. Phosphorus. Chemistry Division, Los Alamos National Laboratory. Retrieved July 27, 2007. Emsley, John. 2000. The Shocking History of Phosphorus: A Biography of the Devil's Element. London: Macmillan. ISBN 0333766385. Greenwood, N.N., and A. Earnshaw. 1998. Chemistry of the Elements, 2nd ed. Oxford, UK: Burlington, MA: Butterworth-Heinemann, Elsevier Science. ISBN 0750633654. Online version available here. Retrieved August 11, 2007. Lange, Stefan; Peer Schmidt, and Tom Nilges. 2007. Inorganic Chemistry 46: 4028. Olander, A. Nobel Prize in Chemistry 1956 - Presentation Speech, by Professor A. Ölander (committee member). Retrieved August 12, 2007. Threlfall, Richard E. 1951. The Story of 100 Years of Phosphorus Making, 1851-1951. Oldbury [Eng. ]: Albright & Wilson. OCLC 2629587. Acute Yellow Phosphorus Poisoning. NCBI, PubMed.